Both my headlight levels don't work. Ever since I have owned my car my headlight levels have never worked. I got my bumper off today to test and my multi meter reads 0.2 to 0.3 v is this correct and does that mean both levels are knackered and since I have a reading means I have power. Not sure if it's the correct voltage and wer will I find reliable used parts. The pictures below are just to show what part mine is. Headlight levellers are basically just a variable resistor so instead of checking for voltage you should check the unit using the multimeter on a resistance range, although I don't know what values you should be seeing. See attached pdf for troubleshooting. Thanks very much John for a very helpful diagram and that answers my question. My level component is at fault so need to replace. 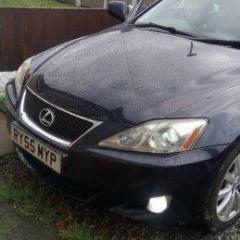 Hi Tony - We Provide Genuine Lexus Parts Cheaper than main dealers. Fill out this enquiry form and a member of the team will price it up for you.